The International Criminal Court (ICC) has confirmed the qualification of the situation in the occupied Crimea as an international conflict between Ukraine and the Russian Federation. International humanitarian law continues to apply to this situation, Crimea's Prosecutor General's Office (PGO) has said. The ICC is studying four informational reports on war crimes in Crimea, its press service on Friday said on Facebook. "The report confirms the qualification of the situation in the temporarily occupied territory of the Autonomous Republic of Crimea and the city of Sevastopol, which arose no later than February 26, 2014 … as an international armed conflict between Ukraine and the Russian Federation," the report said. 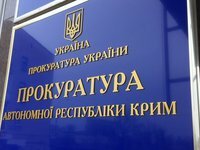 As earlier reported, the Office of the Prosecutor of the ICC plans to complete in the near future an analysis of the subject jurisdiction in Ukraine's affairs regarding Crimea and Donbas and to make an opinion on their admissibility for consideration by the court. "Given that Ukraine has recognized the jurisdiction of the ICC for an indefinite period, the prosecutor's office will also continue to register charges of crimes committed in Ukraine, to the extent that they fall under the jurisdiction of the court," the office said. This report confirmed the assessment of 2016 that the situation on the territory of Crimea and Sevastopol is an international armed conflict between Ukraine and the Russian Federation. "According to the assessment of the prosecutor's office, the law of international armed conflicts remains applicable to the situation in Crimea even after March 18, 2014, since the state of occupation in fact remains in Crimea and Sevastopol," the prosecutor's office explained.